In 1905, Barcelona was still buzzing in wonder over Antoni Gaudí’s extraordinary re-making of the Casa Battló when Pere Milà, a member of the Spanish parliament, and his wife from Reus (Gaudí’s home town) hired the architect to see if he could create another, even greater wonder for them—an entire luxury apartment complex, this time starting from scratch. He was presented with a large empty lot on a typical Eixample xamfrà (bevelled corner) and given carte blanche, backed by a very large budget. Gaudí didn't have to be asked twice. He delved deep into the recesses of his imagination and long study of nature, and five years later unveiled something unlike anything anyone had ever seen before—as much a sculpture as a building, an undulating stone façade (supported by an extremely complex steel armature) that looms over its corner on the Passeig de Gràcia like a cliff. The windows look as if they had been eroded by the sea, their balcony-ledges spilling over with forged iron seaweed made by Gaudí's colleague and decorative specialist Jujol. On top of the cliff mysterious forms arose amid helmeted guardians, in swirls of sea foam. Barcelona's collective jaw dropped. A famous newspaper cartoon depicted the new Casa Milà to a melting cake. But the joking nickname that stuck was La Pedrera, the 'stone quarry'. 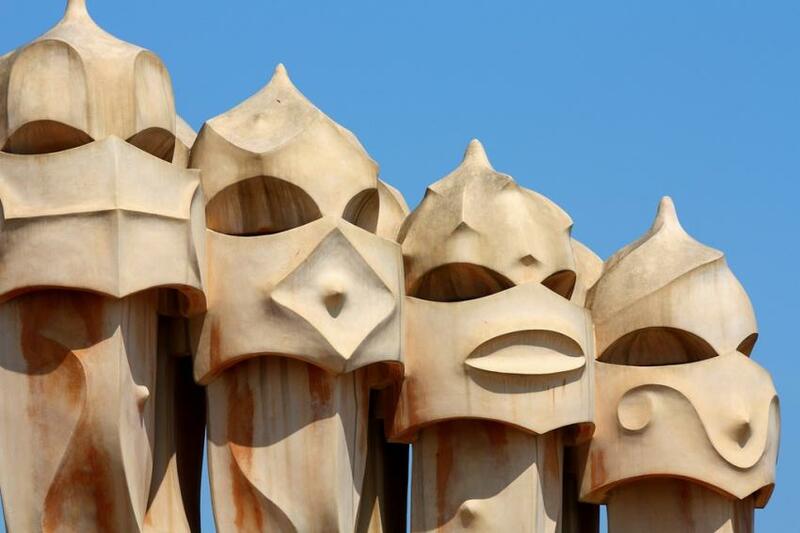 The Milàs, who had been shown only a few vague freehand sketches by Gaudí before the tarpaulins went up around the work, were just as surprised as anyone else when it was finally unveiled. But they drew the line when they learned that Gaudí only really intended their building as a pedestal — for a 40ft statue of the Virgin Mary and a pair of angels—especially as Barcelona had just gone through the church-burning convulsions of the 1909 Setmana Trágica. Furious, Gaudí swore he would never work for the bourgeoisie again, and spent the rest of his life expiating Barcelona's church-torching sins by building the Sagrada Família. Behind the rugged façade, Gaudí built two irregular circular courtyards, painted in sea green and coral scenes (somewhat unusually for an apartment building) from the Metamorphoses of Ovid, the Founding of Rome, and the Seven Deadly Sins. The courtyards are encircled by winding ramps; Gaudí's original intention was to allow residents to drive their newfangled cars right up to their doors, but instead he settled for building Europe’s first underground car park. In 1994 it was converted into concert hall. Because of La Pedrera's steel skeleton, Gaudí could dispense with interior load-bearing walls, allowing him the freedom to make every apartment unique. The one open for visits on the fourth floor, El Pis de la Pedrera is a **re-created Modernista apartment, chock full of the latest in modern plumbing and gadgets—electric lights, appliances and telephones. The first residents who moved in complained that none of their furniture fit in rooms that had no corners; Santiago Rusinyol joked that they would have to replace their pet cats and dogs with snakes. Gaudí's quiet attention to detail is extraordinary: door handles, for instance, are designed to be opened with the left hand, as the right would turn the key. 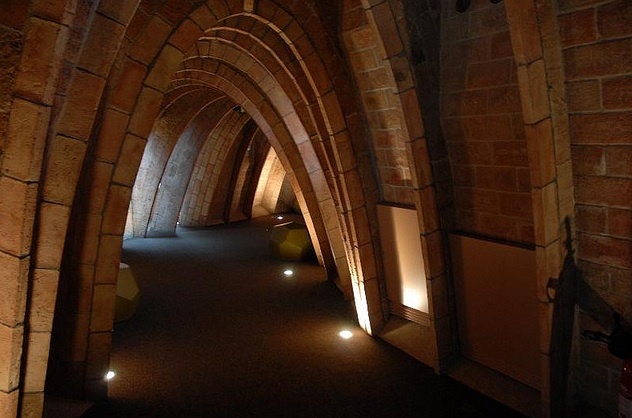 Casa Milà’s attic, of course, is no ordinary attic, but a deluxe version of the attic in Casa Battló—a swooping tunnel of catenary parabolic arches that resemble the ribcage of a dragon. Where the maid servants once hung out the wash, 13 apartments were later squeezed inside, all deconstructed in La Pedrera's massive restoration in 1986 to create the Espai Gaudí. This provides an overview of the master's work in models, photos, drawings and videos; it's a good place to get a look at his few buildings outside of Barcelona and some that are usually impossible to visit such as Bellesguard and Casa Vicens. Gaudí knew that when God in heaven looked down at His dear son Antoni's buildings, the first thing He saw was the roof, so he always made sure these were just as good as the rest of the building below. 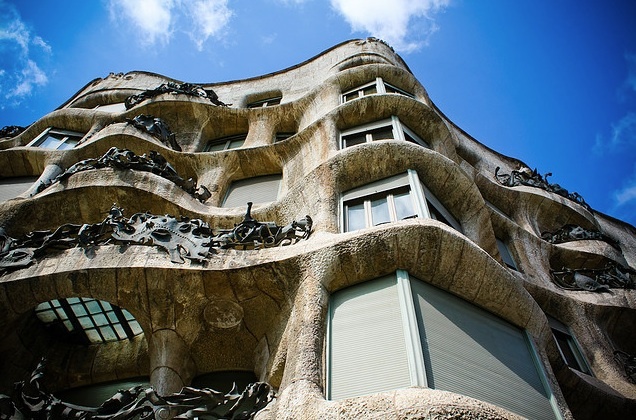 Although Casa Milà would never get its intended giant Virgin Mary, Gaudí made its everyday roof furniture, the chimneys and ventilators, into a garden of installations that have been called the precursors of Surrealism, Expressionism and Cubism. Visored knights in reddish stone (known as the espantabruixes, or ‘witch-scarers’), keep evil away; four fat globs coated in white trencadis protect the stairs. Broken green bottles resemble a shimmering growth over one of the vents. The views range across Barcelona. 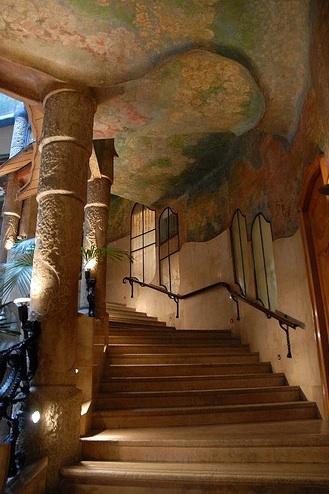 Gaudí, who believed in aesthetics first and safety second, only reluctantly installed the guard rails. Hours Daily 9am-8pm. Buy date-stampled tickets in advance online through the Pedrera's website, and pick them 30 minutes in advance at the ticket office. There's also the option of 'Gaudí's Pedrera: the Origins' guided night tours, with holograms and other special effects, that run year round; book these online as well. Adm €20.50, €16.50 students, €12.50 ages 7-12; under 7 free. €27 (€10.25 ages 7-12) for premium tickets entrance via Passeig de Gràcia, good for six months instead of a specified time. Gaudí's Pedrera: the Origins €37, €17 ages 7-12. Combined day and night tours (done within three days of each other) €37.50 and €17.50 ages 7-12.